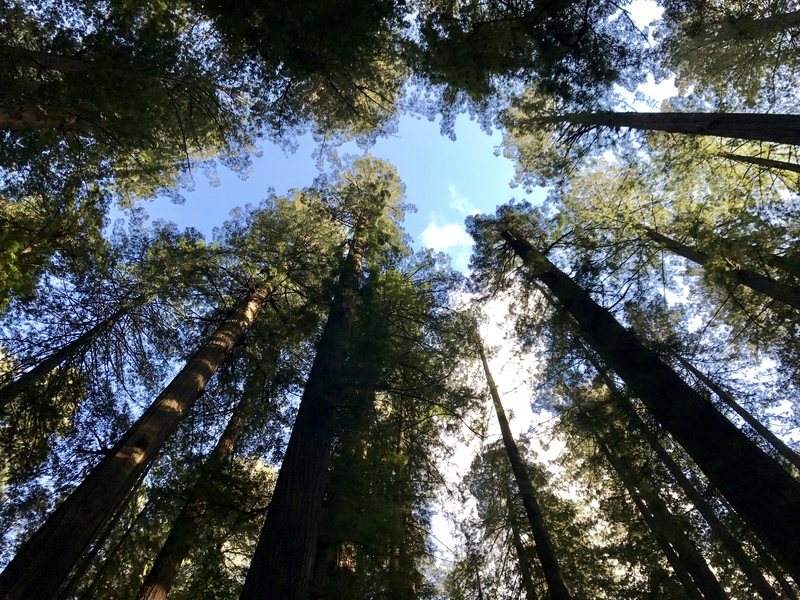 One of our “must-sees” in northern California was the tallest living things on earth are the Coast Redwoods, sequoia sempervirens. Sixty-five million years ago, when dinosaurs roamed the planet, groves of these stately trees covered much of the northern hemisphere. The ice age and subsequent changes in climate and topography eliminated most of these giants, leaving only the redwoods in a narrow 450 mile long by 40 mile wide strip of the southern Oregon and northern California coast, along with their close cousins, the shorter but more massive Giant Sequoias found in California’s Sierra Nevada mountains, and the relatively diminutive (at “only” 115 tall!) Dawn Redwood native to northern China. During one of the seemingly rare sunny days of this rainy spring, we drove south from our campground in Trinidad to experience the Avenue of the Giants in Humboldt Redwoods State Park. 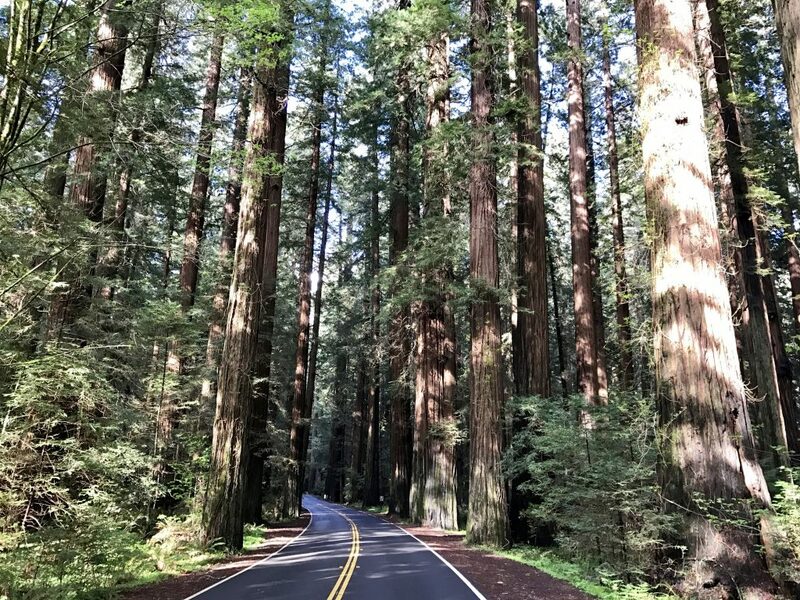 This famous scenic drive is a 32-mile portion of old Highway 101 between Scotia and Garberville. 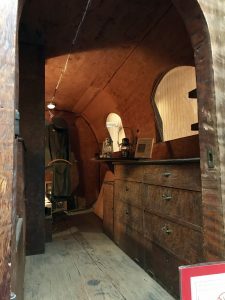 It parallels today’s US-101, and is marked with signs as a “scenic alternate route”, although you would not want to take even a moderate size RV on this narrow road. Unbelievably, this old-growth forest came close to being wiped out. 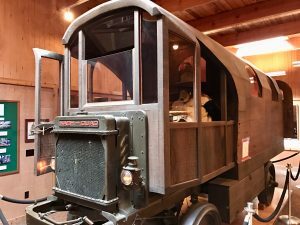 In the early 1920s, a group of concerned citizens realized that the heavy logging of the old-growth forests that had started 20 years earlier was like to “chopping up a grandfather clock for kindling.” These far-sighted conservationists founded the Save the Redwoods League, which began acquiring redwood groves. With the help of many generous supporters, including two $1 million gifts from Nelson Rockefeller, the League has managed to acquire more than 53,000 acres, an area almost twice the size of San Francisco. 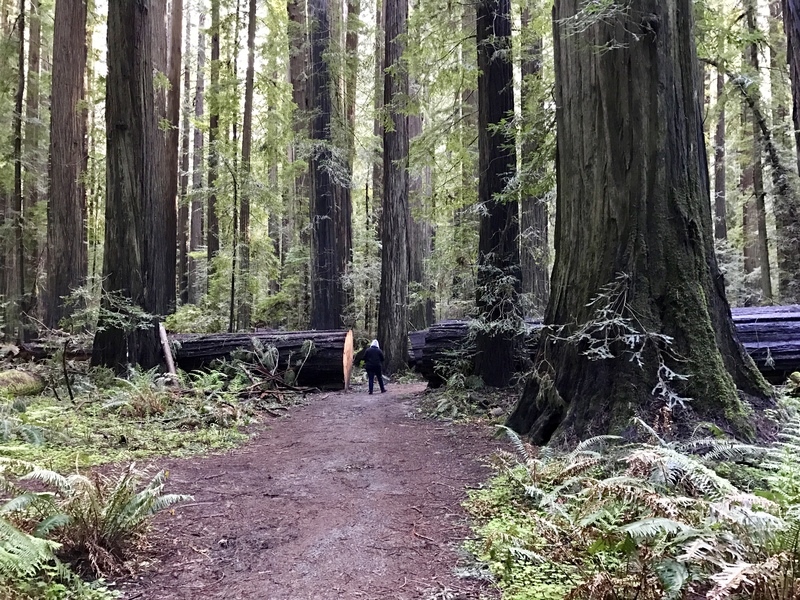 About one third of this area is old-growth redwood forest—the largest expanse of ancient redwoods left on the planet. Our first stop was at the visitor’s center, operated by volunteers from the Humboldt Redwoods Interpretive Association. Near the parking lot, we found this section cut from a redwood that fell nearby in December 2006. This cut was from about 70 feet above the base of the tree. By counting the rings in the tree, scientists were able to determine that it was “born” in 912 C.E.–more than 1,100 years ago! 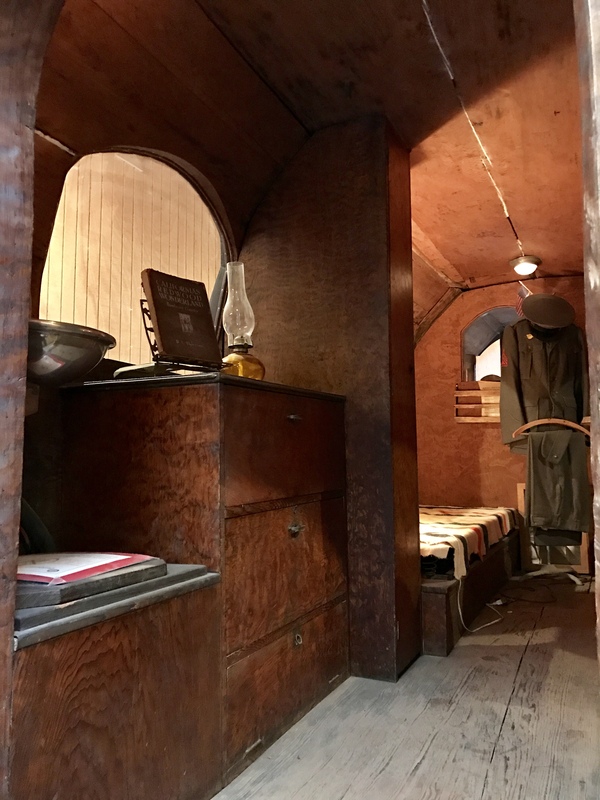 During the lifetime of this giant–which was only “middle-aged”, considering the average 800-2,000 year lifespan of a coastal redwood–the Vikings landed in North America, Genghis Khan conquered Persia, the printing press was invented, and the Pilgrims arrived at Plymouth Rock. 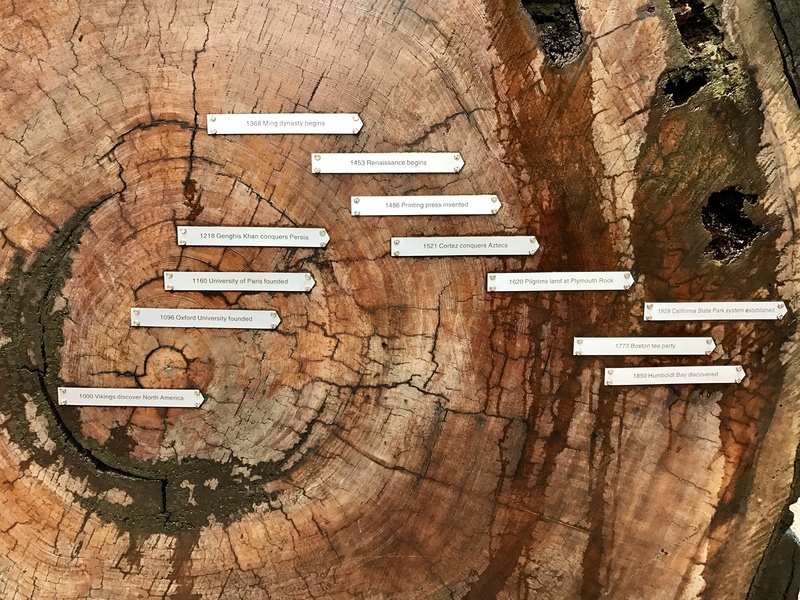 Looking at the tree’s rings was like going back in time. 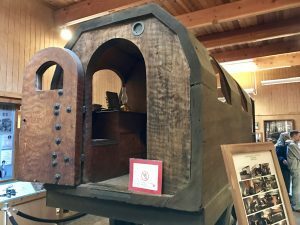 Inside, the visitor’s center featured a number of interesting exhibits, but one of the most unusual to us as RVers was the original “Travel-Log”. Charles Kellogg, a naturalist, woodsman, rancher, artist and philosopher, was awed by the magnificent coast redwoods, and in 1917 he decided to show the rest of the country that the trees needed to be protected. Using a one-man saw, Kellogg cut off a 22-foot-long section of a fallen 11-foot-diameter redwood. 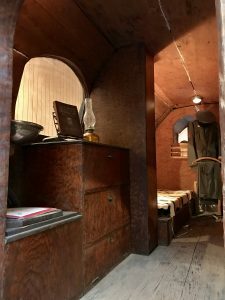 With hand tools, Kellogg and two helpers than began shaping the 8-ton piece of timber into a dwelling. Leaving the visitor’s center, we slowly drove the rest of the length of the Avenue of the Giants, and then returned to the Founder’s Grove, which honors the foresighted founders of the Save the Redwoods League, for a half-mile walk through one of the oldest parts of the forest. In several places, sections of enormous downed trees had been cut out to make way for the trail. The Founders Tree is one of the largest redwoods in the grove. It is more than 346 feet tall and almost 13 feet in diameter at the base. From the ground to the lowest limb is more than 190 feet. We truly felt small standing next to it and the other ancient giants nearby. 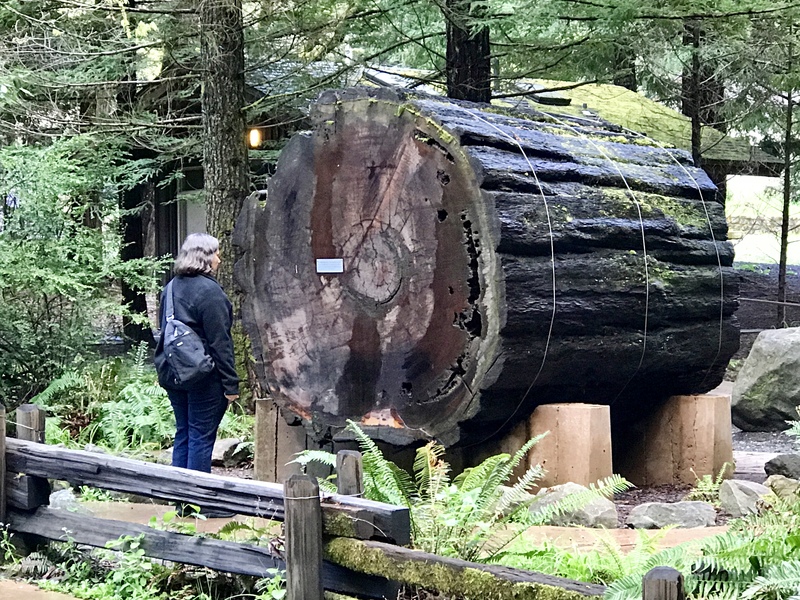 As we continued along the trail, an interpretive guide booklet explained how redwoods can survive the many fires that occur naturally during its lifetime. 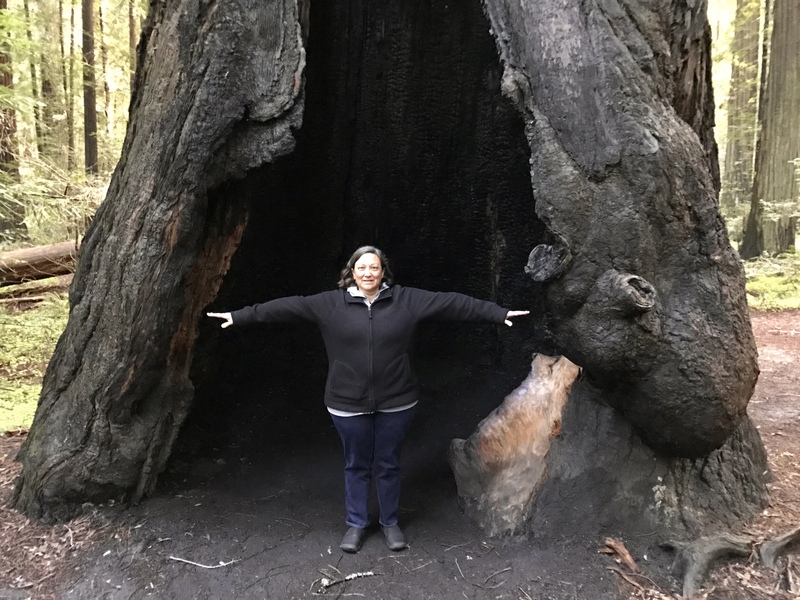 Their 6-12″ thick bark helps to insulate the living portion of the tree, and their wood doesn’t contain the flammable resins found in many other species. 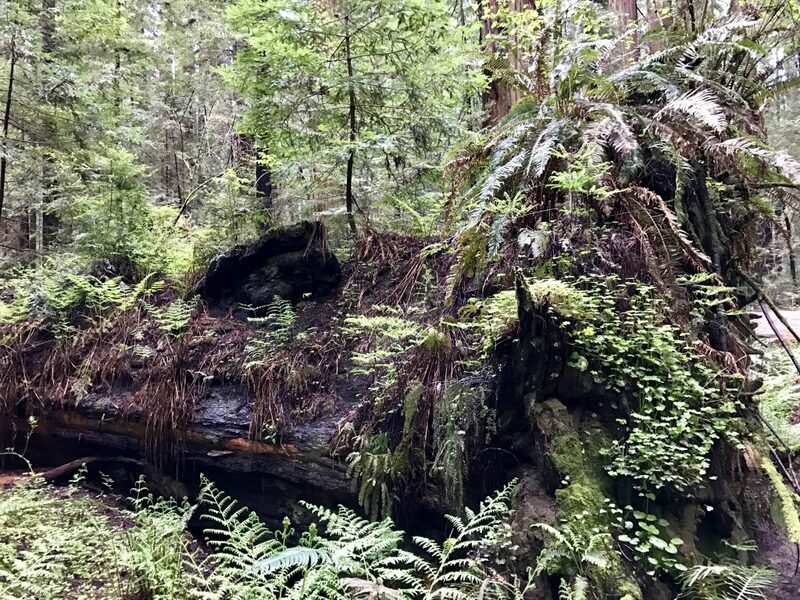 In addition, their sheer size allows them to grow around fire-damaged sections; we saw several redwoods like this one that had been burned out at the base but were still growing tall and strong. We also learned how critical downed redwoods are to the life cycle of the forest. Fallen trees are a reservoir of organic material and water that other plants, trees and animals depend on. 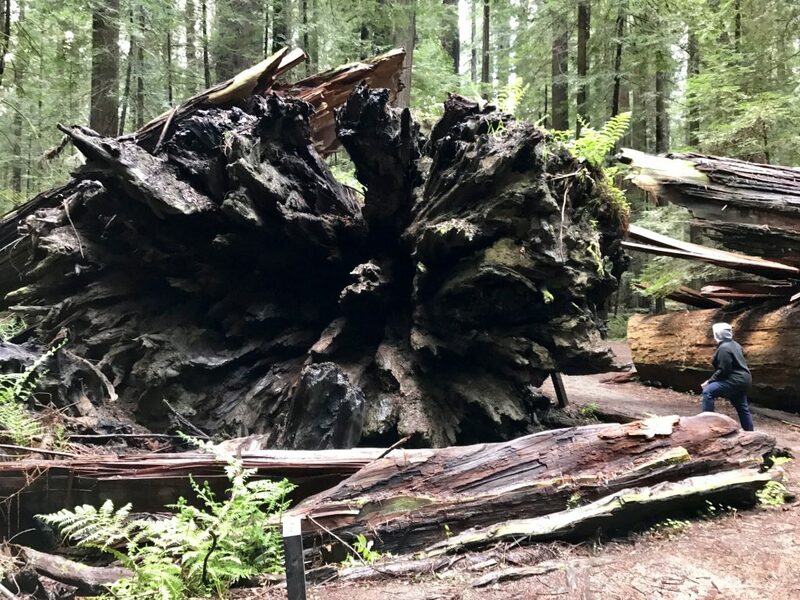 As a redwood slowly decays over hundreds of years, it becomes a nursery for new life–up to 4,000 different species on a downed log! 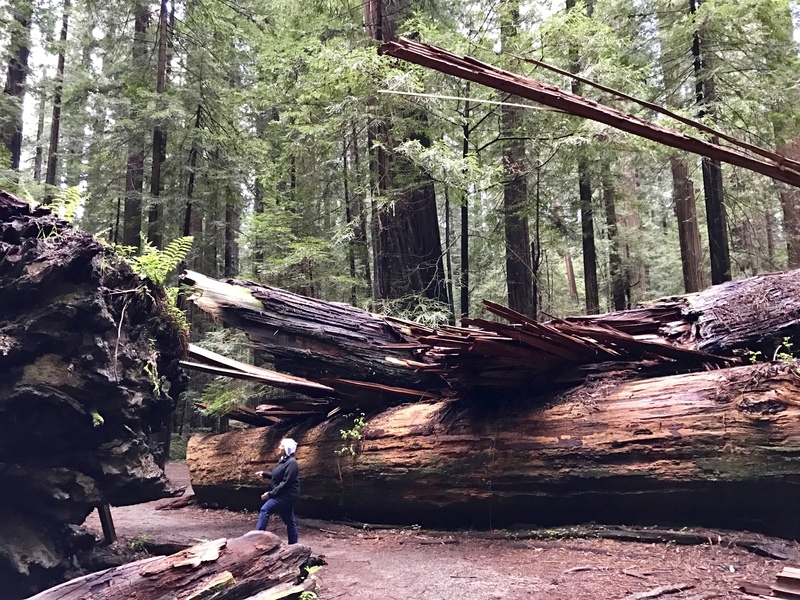 For this reason, the park asks visitors not to climb on or even touch the downed trees. Falling trees also open up spots in the forest canopy, allowing sunlight to reach the forest floor and helping new trees to grow. 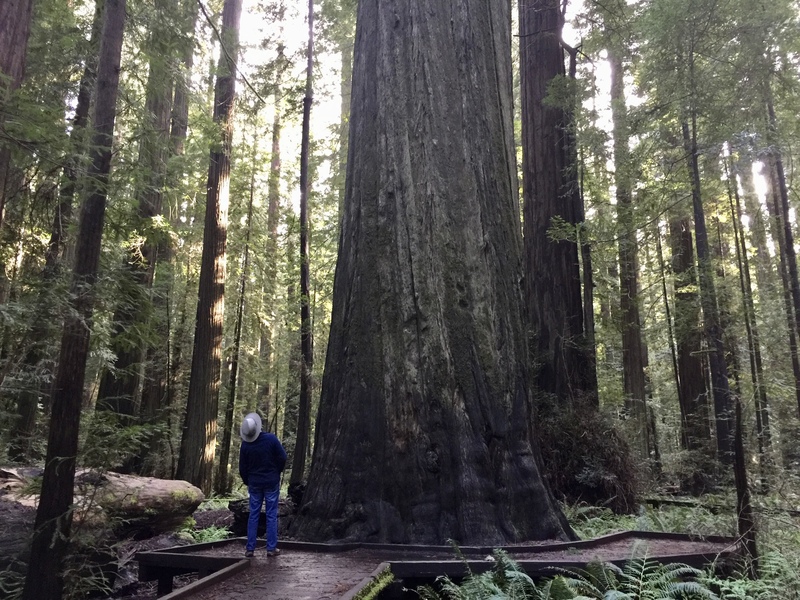 This massive redwood, known as the Dyerville Giant, had stood for about 1,600 years before it came crashing down on March 24, 1991. It was about 370 feet tall–two hundred feet taller than Niagara Falls, or about the same height as a 30 story building. It is 17 feet in diameter and probably weighs more than million pounds. When it fell, a neighbor a mile away heard a loud crash and thought it was a train wreck! As the late-afternoon sun got lower in the sky, the temperatures fell quickly. We returned to our truck and drove home to Trinidad, feeling very much humbled and awed by the incomprehensibly old and huge titans of the forest we had just visited.